I'm currently running Michelin XRV 235/80R/22/5/G but am looking at Sumitomo ST 718 which I believe has a 245/75R/22.5/G. If I buy the Sumitomo's, can I have them mounted on my current wheel rims? Also, what should the difference be regarding mileage, speed, durability, etc? To see the size differences go to: Tire size calculator It is up to you to determine if a larger tire will contact anything on your MH suspension, body, or in the case of dual wheels-each other. The DOT requirement is 1.5" between tires at the closest point. Even that requirement may be dealt with by using a spacer between the rims: WheelAdapter.com is your number one source for wheel adapters, wheel spacers, used wheels, and wheel studs.. Fred will machine adapters to meet your specific requirements. Denny - The Specs on the two tires are similar but do have some differences. The Michelin 235/80R/22.5 can be mounted on either a 6.75" or 7.50" rim, I don't know which size your coach uses. The Michelin tire has a 37.1" diameter is 9.2" wide and needs a spacing of a minimum of 10.3" between duals. The tire turns 556 RPM (revolution per mile}and has a recommended top speed of 75MPH. According to their website the Sumitomo 245/75R/22.5 will also mount on a 6.75" rim but the preferred rim size is a 7.50" rim. The tires diameter is also 37.1", the width is 9.6" and the minimum spacing between duals is 11". Revolutions per Mile is similar 563RPM but the recommended top speed is 65MPH. I would guess you would be able to use the Sumitomo tires but because they are wider before I bought them I would have the dealer measure to be sure the duals would have enough spacing to prevent kissing and I would be questioning why the recommended speed is 65 MPH compared to 75 for the Michelin's. Are they inferior? I must be missing something here. It is hard for me to imagine 11" between tires! I would have thought it was closer to three or four max. 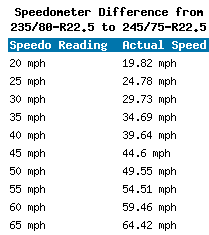 As for the max of 65 mph, that's ok as I have the same restriction on the car I tow and I rarely go over 60 anyway. Interesting figures you sent, thanks. I was in the same boat looking at replacements for my 7 yr old XRV's in that size. After pricing Sumitomos, Toyos & Bridgestones in the 245 75/22.5, I decided to stay with the original XRV size. Going to get them installed on Monday..Price diff didn't end up being all that much more for the Michelins compared to the others.. I believe the reference is to the distance between centerline of the rims, not the distance between the tires. Also, someone mentioned using spacers, use care here, you would be moving the outer wheel/tire out, increasing the forces on the wheel bearings. I made the same tire change on my 1997 Discovery a couple of years ago. The Sumitomo's mounted fine on my rims ( although I can't tell you what size my rims are) and the clearance between the duals is more than enough. The max speed is listed as 65 mph. I rarely go that fast and if so only for short periods of time coasting down passes. I am also in the cool Northwest, high speed probably adds more heat which causes problems. I am not worried about that since the temps on the passes are usually low. 5000 miles later I am happy with the Sumitomo's. They ride much smoother than the Michelins I replaced. Handling is better with no wandering. No air loss over a season. Wow! You live in the wrong place! Here in central Texas, XRV's are going from $500-600+ while Sumitomos are going for about $300. FWIW, and I've written about this several times, Michelins don't have to be changed out unless they are cracked or for some other reason require it. Otherwise, you can keep them safely until they are 10 years old and then change them. People get this seven year figure in their head and think that because someone else says so, it must be so. Read the Michelin specs and you will see if this applies to you (it does). If you want to change them out early, no problem, just be aware you don't need to. Denny, The 11" would be from center of outside dual rim to center of inside dual rim or I suppose you can measure from center of tire to center of tire. I rarely go over 60 MPH myself, but I like to have a little leeway so I go with the 75 MPH tire. I just replaced my 255/80R/22.5 Michelin's with 265/75R/22.5 Bridgestone's. Priced all brands before buying. The Bridgestone's were $115.00 less per tire than the closes other brand. The Michelin's rode a little softer, but the Bridgeston's handle much better. tires & alignment are done! Mechanic told me the front end was out of spec with too much toe out. Drive home was definitely smoother with not as much wander, tires were nice & fresh all made in Feb of this year...glad I stayed with the Michelins..